Explanation: What created this great cliff on Mars? Did giant waterfalls once plummet through its grooves? With a four-kilometer drop, this high cliff surrounding Echus Chasma, near an impressive impact crater, was carved by either water or lava. A leading hypothesis is that Echus Chasma, at 100-kilometers long and 10-kilometers wide, was once one of the largest water sources on Mars. If true, water once held in Echus Chasma likely ran over the Martian surface to carve the impressive Kasei Valles, which extends over 3,000 kilometers to the north. Even if initially carved by water, lava appears to have later flowed in the valley, leaving an extraordinarily smooth floor. 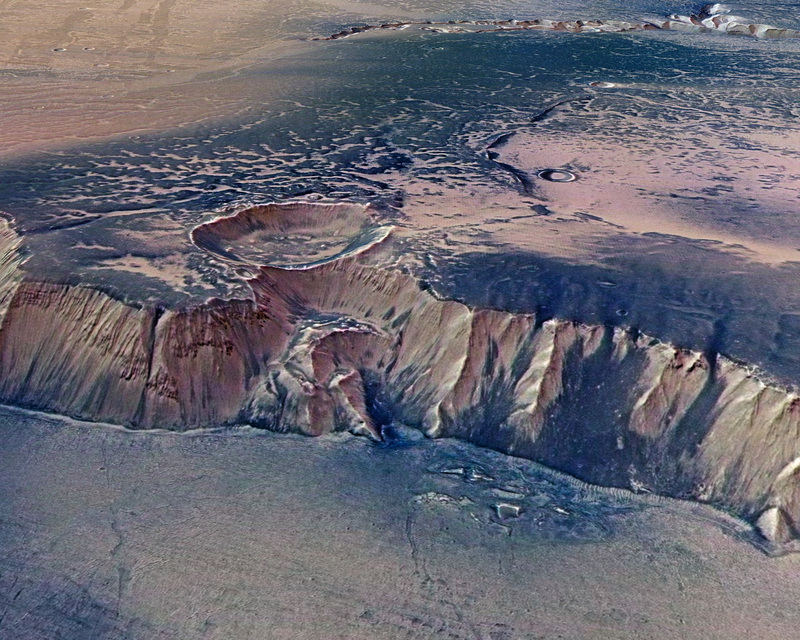 Echus Chasma lies north of tremendous Valles Marineris, the largest canyon in the Solar System. The above image was taken by the robotic Mars Express spacecraft currently orbiting Mars.